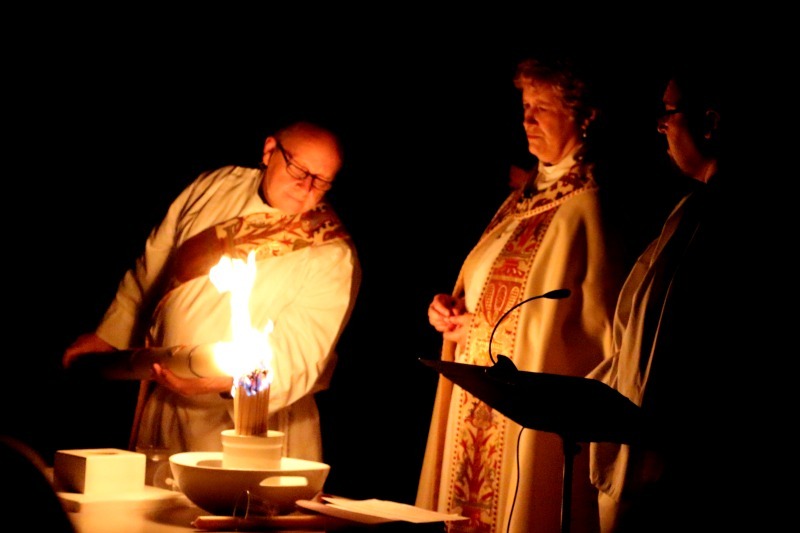 Our first Easter Vigil in the Episcopal Church was quite a memorable one. We watched the Pascal candle burn brightly in the dark of night, the knock on the door ringing through the quiet, candlelit darkness symbolizing Christ’s rising from the tomb. We filed into the nave which was surprisingly bright and dazzling, filled with gorgeous flowers and joyful music and the sweet scent of incense. And at the height of this evening, our little family was baptized, and welcomed to be members of Christ’s church, in a ritual that has played out for millennia during this sacred service. It was a pretty spectacular way to jump into the tradition of Holy Week and Easter, and just our first step in a lifetime of tradition within our faith. Our immersion into the Liturgical year and what it meant to observe Lent and Holy Week was one we jumped into with both feet, but it was daunting. We had already been married for several years and our daughter was already a preschooler. I was very interested in starting new family traditions and observing the feasts and Holy Days, but felt like I was getting a late start. I worried that since we hadn’t grown up doing these things, and our daughter hadn’t been steeped in these traditions from birth, it would feel awkward and stilted. Something that I’ve come to realize, as we’ve grown up more with our church and followed the rhythm of the church calendar for several years now, is that all traditions start somewhere. And right now is as good a time as any to start another one. It doesn’t take long to start feeling like second nature, and becomes easier with each passing year. One tradition we’ve kept fairly well is to attend all the important services of Lent and then Holy Week. Just by observing these days, hearing those ancient words and penitent prayers, and really contemplating the story of what happened during Jesus’ last week as a mortal man, we become part of the tradition. We’ve also brought our children to the late night services, such as Easter Vigil, even if it means coming in their pajamas. Because that awe-filled moment of the giant Paschal Candle coming to burning life in the midst of the velvety darkness is an amazing experience, and I want my children to have it in their memory. Another memory I want them to keep is that joy of returning to the nave, which had previously been stripped of all color and ornamentation, to find it a room filled with beauty and happiness. These are the emotions and knowledge I want them to keep all the days of their lives. I want the story of Christ’s death and resurrection to be something they can see, hear, smell and touch. It is a feast for the senses, and makes so much more of an impression than a photo with a bunny and an Easter basket. I want them to have these experiences so that they are etched in their memories. So we put on the PJs, and we go. And we are never sorry! As for our home traditions, we are pretty laid back. I’ll get out the Easter themed books we have in our home and search some out in the library and keep them in a basket in the living room. We make a simple Easter themed arrangement on our dining room table with spring flowers and a little icon or pretty Easter themed postcard or picture. I also really love the idea of books as Easter presents, since they can be enjoyed much longer than chocolate Easter bunnies (and cause less cavities!). Something new I’ve decided to do this year (because now I’m all about starting new traditions when the mood strikes!) is to get each of my kids and my Godson a small icon for their Easter basket. It might be a saint they share a name with, or have something in common with (such as St. Francis for an animal lover of St. Cecelia for a budding musician). My idea with this is that by the time they’re adults, they’ll have a nice little icon collection they can take with them into their own homes, where I hope that they will begin their own faith traditions. Because, ultimately, that is my goal for all the little things we do as a family in our home or in our church. I want to give my children good memories and countless ties to their faith so that they know they are loved and valued by God, and part of a tradition that goes back thousands of years. I know our traditions will change as our kids grow older and then they go on to have their own families. But we are all part of a larger tradition that began long before we are born. How we choose to take part in it is up to us, and it’s never too late to join in! 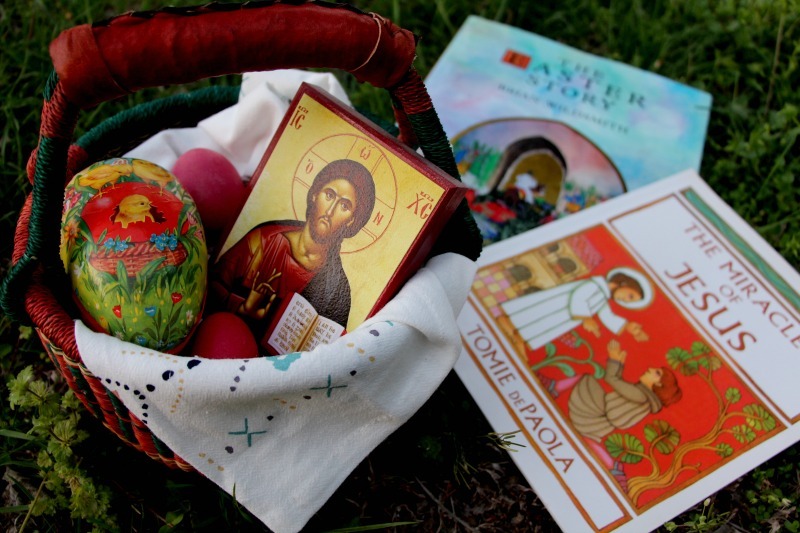 What Holy Week and Easter traditions are part of your family life? What might you begin this year? I took my kids (7 and 5) to a living stations of the cross performed by middle school youth this year at a local Catholic Church. I was pleasantly surprised how much they got out of it and the parts that they remembered and asked questions about. It was meaningful for all of us.